My 103 day, Silk Road Odyssey from Bangkok to London in an old MGB is all over. ‘Burgundy,’ my 45-year-old car is safely in London and I’m looking for a new home for it, anyone want a well looked after English sports car? Comprehensively overhauled and then used for one little 25,000km trip. Days 84 to 88 took us out of Iran and well across Anatolia, the larger Asian chunk of Turkey. It meant I also said goodbye to another co-driver. Since Maureen couldn’t come along on this trip I’ve had a changing cast of co-drivers starting with my daughter Tashi from Bangkok to Luang Prabang in Southeast Asia. Tashi joined me again in Mashhad in Iran and shared the ‘seat of luxury’ and the ‘seat of power’ (explanation below) from there through to Erzurum in Turkey. At that point she flew out and English friend Roger Twiney joined me for the last stint through Turkey and across Europe. 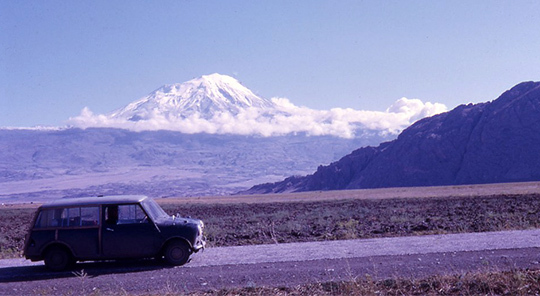 ▲ As we approached the border between Iran and Turkey Mt Ararat, the highest mountain in Turkey and the supposed landing spot for Noah’s Ark at the end of the Biblical 40-day-flood, was crystal clear against the blue sky on the northern horizon. Unfortunately by the time we’d crossed the border into Turkey the morning clouds had rolled in, as they tend to do with mountains, and only the very top of the 5137 metre peak was visible. ▲ It was all there 45 years earlier in 1972 when Maureen and drove west on the Hippie Trail, rather than east on the Silk Road. We were en route to Afghanistan and then on to Australia on the trip which led to the very first Lonely Planet guidebook. ▲ We paused at the Ishak Pasha Palace just outside Doğubayazit, just like Maureen and I did in 1972. This wonderful palace has enjoyed lots of careful restoration in the ensuing years and attracts far more visitors today although, unfortunately, you can’t climb the minaret like we did on that earlier visit. ▲ Next stop Erzurum where local kids were out getting their first driving lessons in the town square. 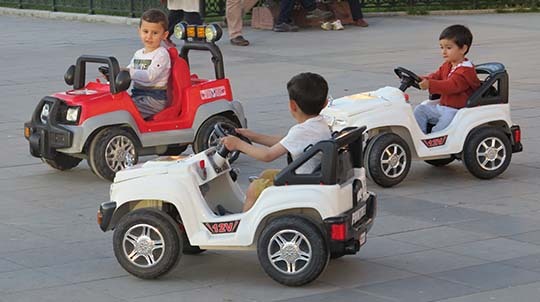 Kids racing around in electric cars are a familiar sight in town squares right across the region, although the roads they’re training for in Turkey are much safer than the ones we’d just left in Iran. Still not very safe, compared to the better first world standards, but not bad. I’d later joke that here were cars that even a ‘mighty MGB’ could out perform. 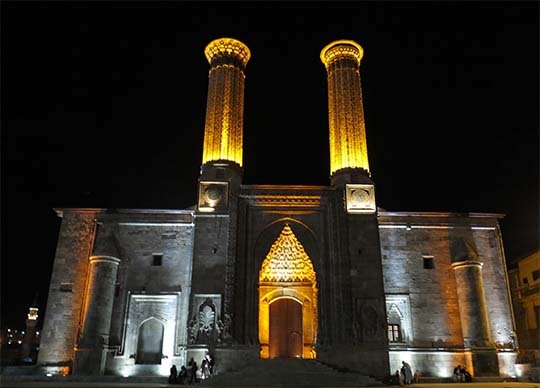 ▲Beautifully lit that night it was easy to see why the twin-minareted Çifte Minareli Medrese is Erzurum’s iconic building. We continued on to dine at high speed in the nearby Güzelyurt Restaurant, an old-fashioned place with a reputation at the city’s iconic eating place. It’s certainly a high speed eating place, we sat down and were quickly offered a choice of chicken or onion soup, then borek, a main course choice of beef or lamb, a choice of four desserts, tea – bang bang bang bang – finished. 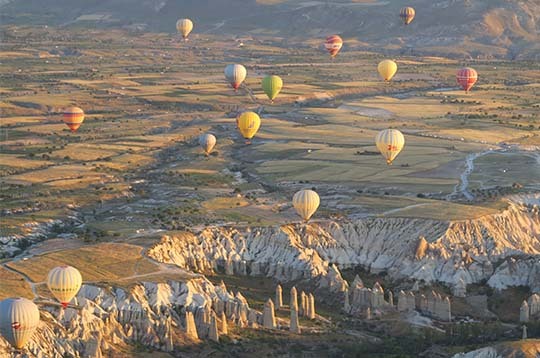 ▲ Then it was on to Cappadocia and, just like in 2014 when Maureen and I visited with a Global Heritage Fund group, we did a hot air balloon trip. This is one of the best places in the world for hot air ballooning and as a result the dawn skies are full of balloons. 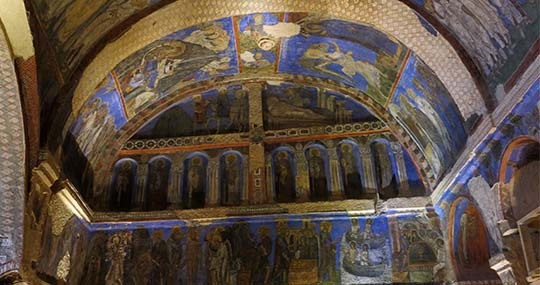 ▲ Late that today we explored the cave-churches in the Göreme Open-Air Museum with their brilliant frescoes like in the Tokalı Kilise (Buckle Church). 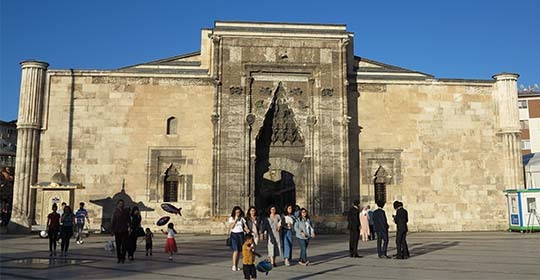 ▲ My 2014 Turkey trip also paused at the magnificent and massive Sultanhanı caravanserai, the largest along this old Silk Road route it was constructed by the Seljuks in 1229. 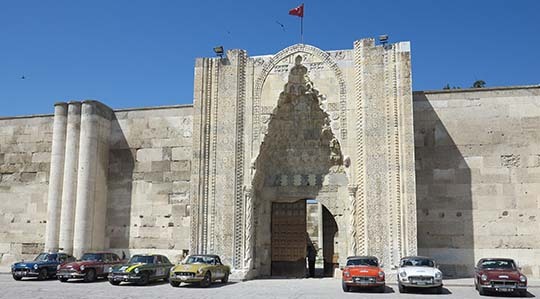 We lined up our Silk Road MGBs in front of the building where we were ambushed by the Sultanhanı mayor and ushered back to his nearby office for tea.